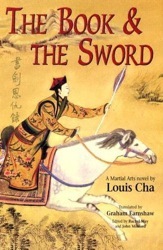 I just finished reading The Book and the Sword (æ›¸åŠæ©ä»‡éŒ„) by Jin Yong (or Louis Cha). For better or worse, I’ve become somewhat addicted to Jin Yong’s novels. Wikipedia never ceases to amaze me. The article on Jin Yong links to an article on The Book and the Sword, which–in addition to having a fairly complete plot summary–links to the official site of a recently published English translation (complete with the complete text of the first chapter), and even an English-language “Wuxiapedia” article that details changes made in the third edition of the book (“wuxia” æ­¦ä¾ means something like “martial arts heroes”). The changes listed in the wuxiapedia are actually pretty major: a major character runs off instead of committing suicide, one of the main antagonists shows a sign of a heart before dying, and an extra chapter is added at the end. I must have read the second edition! This book is based on the folk legend that Emperor Qianlong was actually a Han Chinese, a story that I’ve heard from numerous taxi drivers in Beijing, but that probably isn’t true. Famous historical characters often play key roles in Jin Yong’s novels–Ghengis Khan plays a major role in The Legend of the Condor Heroes å°„é›•è‹±é›„ä¼ , and Kublai Khan shows up in The Return of the Condor Heroes ç¥žé›•ä¾ ä¾£ (both of which I’ve only seen TV versions of). My favorite so far, though, is Kangxi in The Deer and the Cauldron é¹¿é¼Žè®°. Hmmm… the English names of these books sound so ridiculous! The Return of the Condor Heroes! 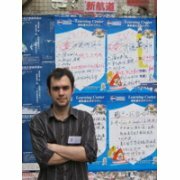 I’d like to write a bit more about what is so appealing to me about Jin Yong’s books… They’re more than just a good read. – Wuxia is actually two words: Wu and Xia. Wu is martial arts, and Xia here refers to a code that martial artists uphold, similar to chivalry. A Xia is someone who’s renowned for fighting for the ideals of the code of Xia. Martial artists are meant to respect the Xia a lot more than the Wu. Those who excel in Wu but fail in Xia are looked down upon by martial artists, and are often the antagonists. Jin Yong protagonists showcase various aspects of Xia. Even his anti-hero Wei Xiaobao (in The Deer and The Cauldron), who is a total failure in Wu and generally nothing more than an arse-kissing scumbag, is known for his fierce, second-to-none loyalty to friends, risking enormous wealth (which he obsessed over) and death to protect them. Thanks for your reply! Wuxiapedia.com is a really cool site. I’m reading å€šå¤©å± é¾™è®° right now, and I’ll look forward to getting your site’s perspective after I finish it.